Get here NCERT Solutions for Class 11 Chemistry Biology 17. 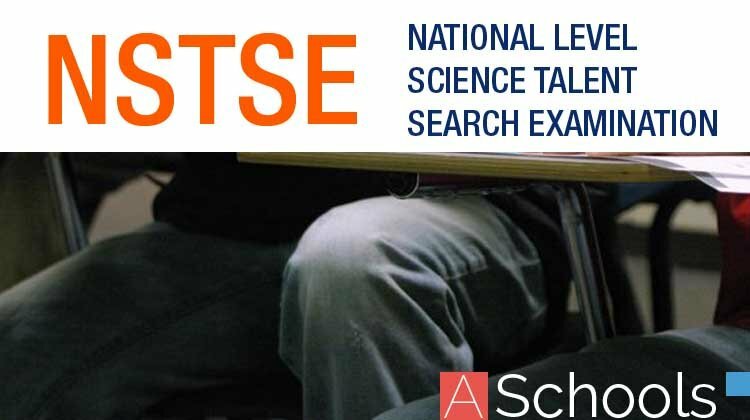 These NCERT Solutions for Class 11 of Biology subject includes detailed answers of all the questions in Chapter 17 – Breathing and Exchange of Gases provided in NCERT Book which is prescribed for class 11 in schools. Answer Vital capacity is the maximum volume of air that can be exhaled after a maximum inspiration. It is about 3.5 – 4.5 litres in the human body. It promotes the act of supplying fresh air and getting rid of foul air, thereby increasing the gaseous exchange between the tissues and the environment. Answer The volume of air remaining in the lungs after a normal expiration is known as functional residual capacity (FRC). It includes expiratory reserve volume (ERV) and residual volume (RV). 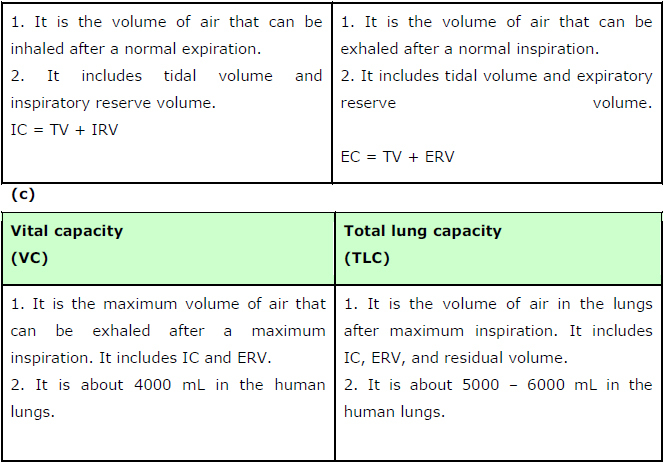 ERV is the maximum volume of air that can be exhaled after a normal expiration. It is about 1000 mL to 1500 mL. 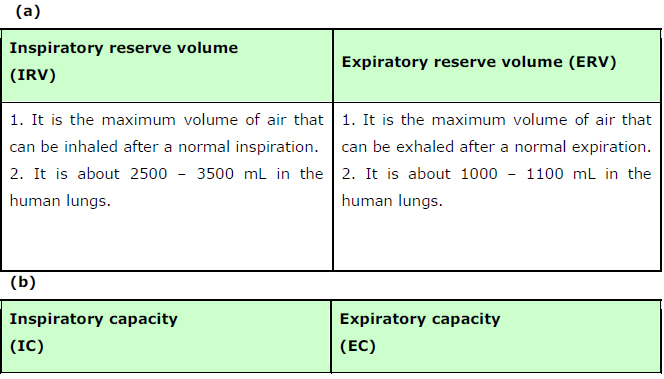 RV is the volume of air remaining in the lungs after maximum expiration. It is about 1100 mL to 1500 mL. Answer Each alveolus is made up of highly-permeable and thin layers of squamous epithelial cells. Similarly, the blood capillaries have layers of squamous epithelial cells. Oxygen-rich air enters the body through the nose and reaches the alveoli. The deoxygenated (carbon dioxide-rich) blood from the body is brought to the heart by the veins. 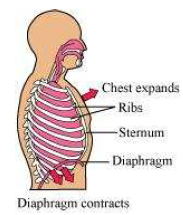 The heart pumps it to the lungs for oxygenation. The exchange of O2 andCO2 takes place between the blood capillaries surrounding the alveoli and the gases present in the alveoli. Answer Plasma and red blood cells transport carbon dioxide. This is because they are readily soluble in water. The partial pressure of oxygen in atmospheric air is higher than that of oxygen in alveolar air. In atmospheric air, pO2 is about 159 mm Hg. In alveolar air, it is about 104 mm Hg. The partial pressure of carbon dioxide in atmospheric air is lesser than that of carbon dioxide in alveolar air. In atmospheric air, pCO2 is about 0.3 mmHg. In alveolar air, it is about 40 mm Hg. Answer The respiratory rhythm centre present in the medulla region of the brain is primarily responsible for the regulation of respiration. The pneumotaxic centre can alter the function performed by the respiratory rhythm centre by signalling to reduce the inspiration rate. Answer pCO2 plays an important role in the transportation of oxygen. At the alveolus, the low pCO2 and high pO2 favours the formation of haemoglobin. At the tissues, the high pCO2 and low pO2 favours the dissociation of oxygen from oxyhaemoglobin. Hence, the affinity of haemoglobin for oxygen is enhanced by the decrease of pCO2 in blood. Therefore, oxygen is transported in blood as oxyhaemoglobin and oxygen dissociates from it at the tissues. Answer As altitude increases, the oxygen level in the atmosphere decreases. Therefore, as a man goes uphill, he gets less oxygen with each breath. This causes the amount of oxygen in the blood to decline. The respiratory rate increases in response to the decrease in the oxygen content of blood. Simultaneously, the rate of heart beat increases to increase the supply of oxygen to blood. Answer In insects, gaseous exchange occurs through a network of tubes collectively known as the tracheal system. The small openings on the sides of an insect’s body are known as spiracles. Oxygen-rich air enters through the spiracles. The spiracles are connected to the network of tubes. From the spiracles, oxygen enters the tracheae. From here, oxygen diffuses into the cells of the body. Answer The oxygen dissociation curve is a graph showing the percentage saturation of oxyhaemoglobin at various partial pressures of oxygen. Answer Hypoxia is a condition characterised by an inadequate or decreased supply of oxygen to the lungs. It is caused by several extrinsic factors such as reduction in pO2, inadequate oxygen, etc. The different types of hypoxia are discussed below. Therefore, the hourly tidal volume for a healthy human is approximately 3.6 × 10^5 mL to 4.8 × 10^5 mL.